A late rally and some clutch hitting from Andrew Benintendi lifted Salem to a series win over Frederick after the Sox had trailed 3-0 and 4-2. Benintendi cut the deficit to one with an RBI single in the seventh, then came up huge with a bases-clearing double in the eighth. Nick Longhi provided the game-tying hit in the seventh. Yoan Moncada reached base three times with a hit and two walks, raising his OBP to .456. He also scored twice and stole his 14th base of the season. Somewhat lost in the dramatic comeback was the first start of the season for Trey Ball. The 2013 first-round draft pick threw 79 pitches in four innings of work. He allowed two runs on three hits, while walking three and striking out five. The Drive were rained out against Delmarva. The game will not be made up as the two teams do not meet again this season, according to a team tweet. Player of the Night: For the second time in as many nights, Andrew Benintendi gets the honor with his clutch four-RBI night. While the Arkansas product just hit his first home run of the season on Wednesday, he has had no problem racking up extra base hits so far with an eye-opening .642 slugging percentage. 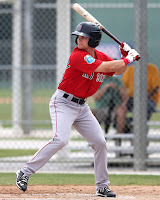 Kevin Burke, a Salem Red Sox reporter, tweeted out last night that Benintendi went an incredible 48 swings in a row without missing over a 12-day span.